This could be one of the most incredible pieces of marksmanship the Internet – and certainly this drone – has ever witnessed. At a recent medieval reenactment in Lipetsk Oblast, Russia (of course) one actor pulled off a spear throw a medieval knight would’ve been proud of. 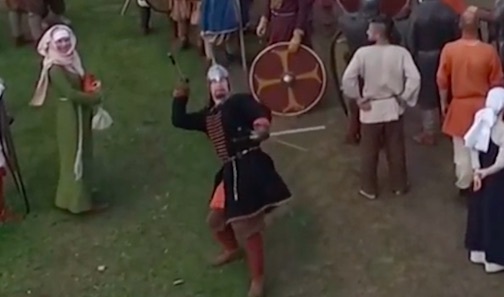 According to Mashable the guy got so annoyed that a nearby quadcopter was capturing the event – probably because there were no drones during the Middle Ages – that he decided to take matters into his own hands. In a pretty impressive show of skill he takes aim and absolutely nails the drone as it flies overhead, sending it spinning to the ground in a ball of flame and twisted metal – well you can imagine that bit. Since the javelin only had a soft tip, it reportedly did very little harm – and the man has apparently compensated the drone’s owner for the minor damage. Maybe they should employ him to guard the perimeter of Heathrow airport – he could definitely keep out any unwanted drone intruders.